Last post I brought you a set of large mammals shot in Yellowstone National Park back in May 2015. Those Big Horn Sheep top out in the 310 pound or so range for the males and then about 190 for the females. Pretty big from a hoofed mammal perspective, but definitely not the top end of the inhabitants at our first national park. Today we push that scale a little higher with these common residents. These Elk (we’ll get to the whole name thingy in a bit) tip the scales between 500 and 530 for the cows and 700 to 730 pounds for the bulls. The predators of the animal world would need to be pretty hungry (and desperate) to take on a mature bull. Something tells me they would be calling for an ambulance to pick up the carnage should they get slammed with a full rack. 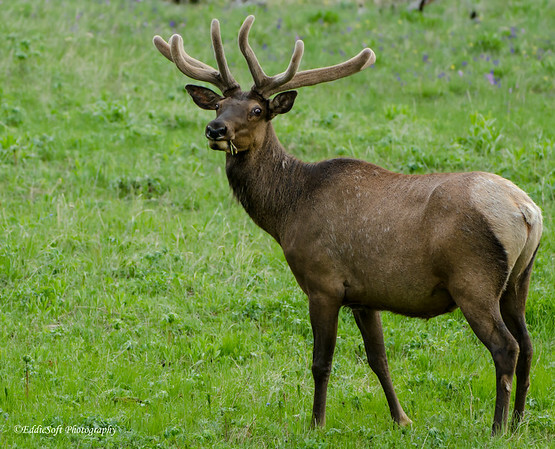 Speaking of racks, these shots are of Elk that are still in their velvet stages of their antler growth. These creatures are pretty common out in that particular region and one doesn’t come back from a trip without a few tins full of Elk frames. They’ve actually been featured on this blog several times now (link here and here). Note, the latter link has some of the most gorgeous antler racks (qualifier added for obvious reasons) I’ve seen on these beasts. From those posts you can tell the transformation from the velvet stages to the mature antler sets. 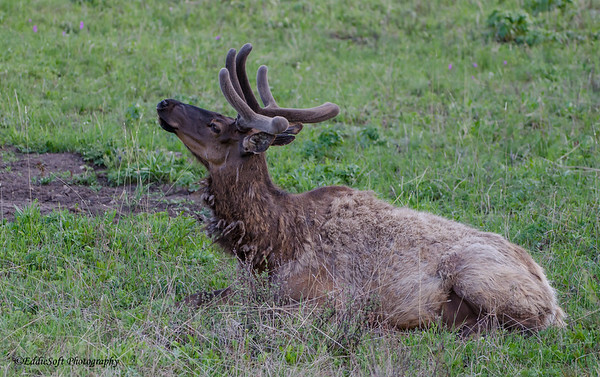 Hit the jump to see a bunch more pictures of the Elk! Must be nice to have a built in belly scratcher (ha). 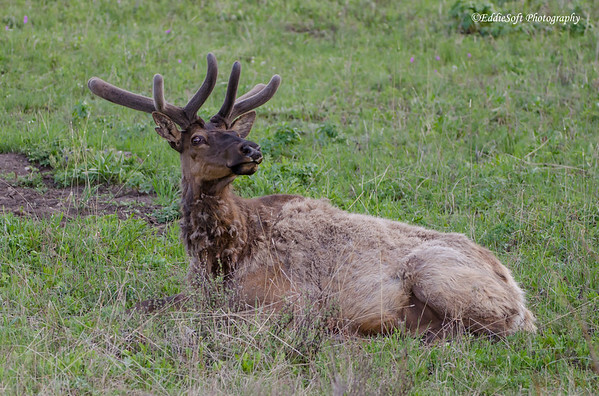 For the most part the Elk are a docile animal and quite frankly a photographer’s delight. They tend to be found moving slowly through the open fields grazing on grasses and the like. When they are not spending their time eating.. they are usually laying down and just watching the wheels go by. They know they are pretty cool and like to ham it up for us digital shutter fiends. I learned something new from our friends over at Wikipedia. 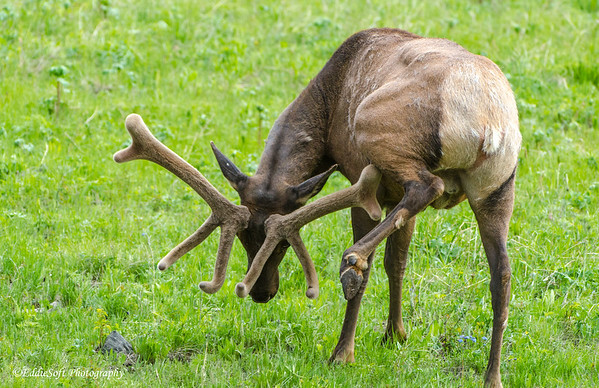 They claim that Elk antlers can range up to 3.9 ft long and weighing in around 40 pounds. 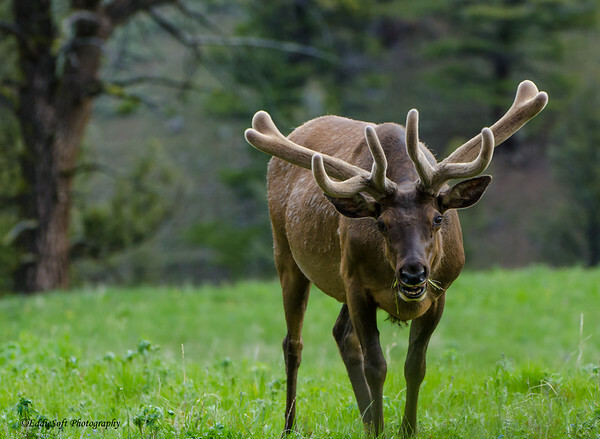 Typically, they have eight or more tines but the surprising thing is they claim this has little to do with their age or maturity – I always assumed the size of the antlers was a direct correlation to the age of the animal. 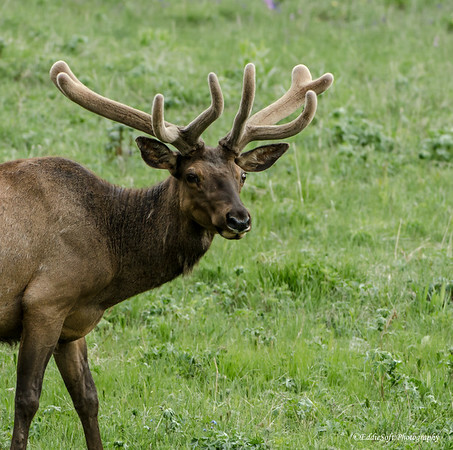 Wikipedia also points out it is the decline of pheromones that cause testosterone levels to drop resulting in the shedding of antlers by early winter. Trivia Crack here I come! Let’s see, what other interesting facts are there. Well, they are ruminants which means they have a four-chambered stomach. As mentioned previously, they are grass grazers but turn to tree bark during the winter. I was aware of their fondness for Aspen buds thanks to the numerous materials I’ve read on Wolf reintroduction. The Aspen population was essentially saved by adding wolves back into the Yellowstone ecosystem. The Wolves kept the Elk population in check which limited their destructive impact on Aspen which had the added benefit of reducing erosion around the river banks – nature is a circle – learn it, respect it, love it. Now if I could just get my hands on the idiots that brought us Asian Carp and Asian Beetles. The last series of shots had to be pulled out of some pretty dark conditions in the digital darkroom. It was getting late when we stumbled on this particular bull hanging out on a hillside outside Mammoth. Although The Beast is an F4, it drinks light like a black hole. Now that we have added a new camera body to our lineup, we should have no problem in low light conditions in the future. However, back in ’13 our shooting cycle would end in late afternoon. Thankfully, the Elk tend to stay relatively calm allowing me to push the shutter speed down enough to get something in the tin. Lightroom was able to pull out the detail leaving me fairly decent shots. I left them in here because I really liked the overall expressions. 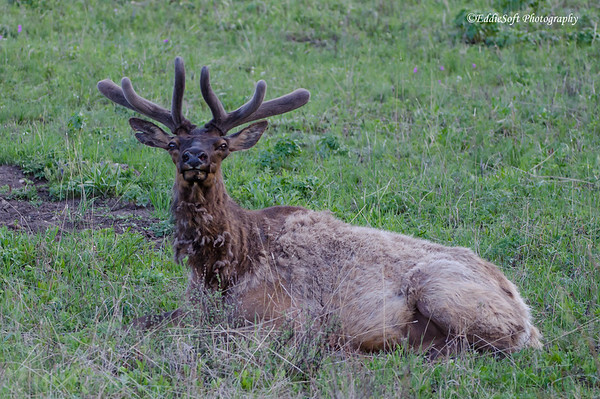 I’m running out of shots and I promised you a quick discussion on the naming of these Elk. They actually have a couple of names with Elk being the most common in North America. That name was given to these animals by our European settlers by mistake. They originally thought these creatures were Moose and therefore gave it their common name for Moose which is .. wait for it .. Elk. 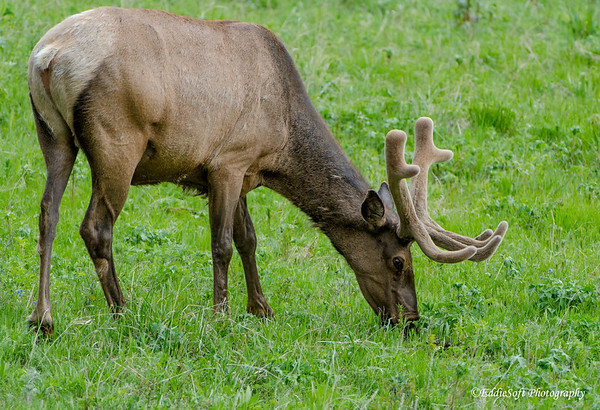 The other name for Elk is the Wapiti. This name comes from the Shawnee and Cree Native American word Waapiti which means white rump. The simplicity of naming that is so prevalent in the birding world. We’ve come to the end of the post my friends. I hope you enjoyed the look at one of our larger American mammals – next post might even bring us a larger animal! Stay tuned. As I think I’ve mentioned before, Wapiti is a crossword clue you see sometimes, the answer being the short entry “Elk”. So I knew that factoid. 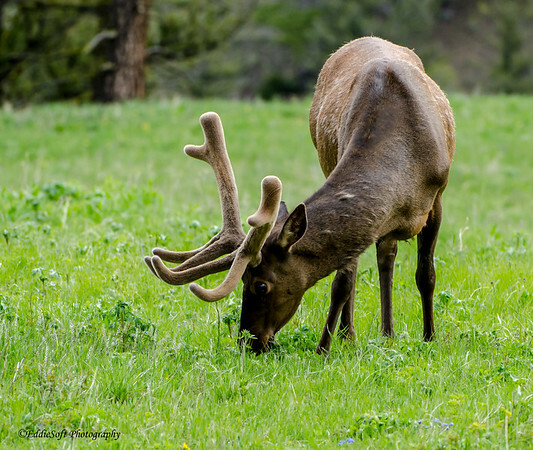 However, I did not know that about the antler sizes being independent of age, nor about their effect on Aspens. I knew they were ruminant like cows, whose stomach allows them to eat grasses. Wow, I just looked it up, and their stomach actually ferments plants in order to get nutrients, which regurgitating and chewing it to soften it up apparently helps. Learn something “ruminentary” every day! Thanks for the pics and information. I think you are right but my cow knowledge is pretty poor beyond they have 4 chambered stomachs and chew their cud – very little seeing as I am neighbors to like 50 of them. They’ve been mooing like crazy this past week – not sure if it is from the cold – don’t think so or more likely startled by roaming coyote hunting parties which have been prevalent as of late. Never hear of them actually taking one of those cows down so not sure if they even want to bother with something that big – probably more accurate is they don’t want to take on the ARs all the farmers have to thwart those killers.